This past week has brought out a few different songs music videos from some of my favorite musical artists so I figured I’d round them up in one article. Last Friday, Chance the Rapper released two new songs: “The Man Who Has Everything” and “My Own Thing.” Both feature the same style of cover art from his previous singles, done by Brandon Breaux. Breaux has created the cover art for every album and single cover that Chance has put out. Most recently, Breaux has switched to more abstract art rather than images of Chance. Similarly, Chance has matured from his “10 Day” days and focuses his raps on political stances, his family, and more serious topics. “The Man Who Has Everything” has Chance rapping about his family and social issues, referencing tearing up confederate flags and targeted police stops. It’s a reflective song and I think that the soul sample used in the chorus helps set the tone. With all of these new singles released by this Chance, and even more so with “The Man Who Has Everything,” it’s clear that Chance is trying to tackle bigger issues as he grows older. As someone who’s from Chicago, it’s refreshing to see a Chicago artist talk about social issues and actively work to fix them. “My Own Thing” is so much more like classic Chance. He raps about being independent and, of course, talks about his fiance, telling listeners: “got a baby, got a house, got-in-laws, go kick rocks.” Apparently, despite Chance having a fiance and kids, girls are still trying to get with him and he’s fed up. It’s great to hear Chance so protective of his family and proudly declaring his love for his fiance. While I like his new songs, it’s nice to have some lighthearted songs devoid of social issues every once in awhile. Also released last friday was Ariana Grande’s “Thank U, Next” music video. This was highly anticipated and, in my opinion, did not disappoint. Throughout the music video there are so many cameos, most notably from Kris Kardashian and Grande’s former Victorious costars. The video is a collection of different pop culture references such as Mean Girls, 13 Going On 30, Legally Blonde, and my personal favorite, Bring It On. I don’t watch a lot of music videos but I enjoyed this one a lot because of the pop culture references and being able to relate as I grew up with these movies. 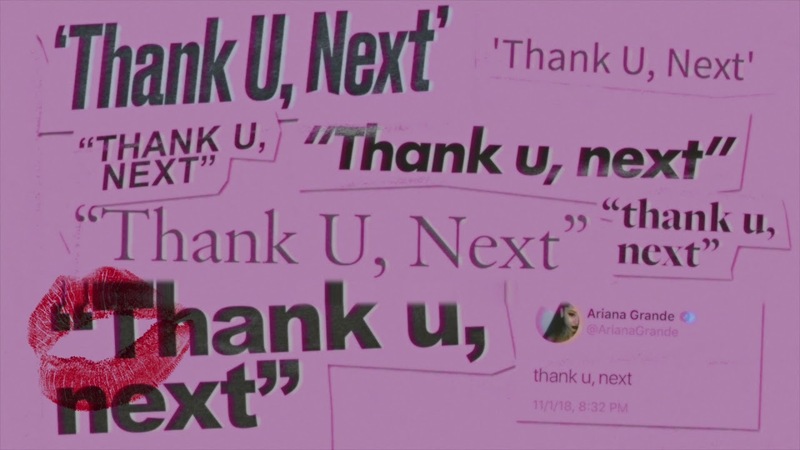 It also helps that “Thank U, Next” is a great song in itself and will most likely be a popular song and pop culture reference for years to come. Noname released her first ever music video with “Blaxploitation”, a song of her latest album Room 25. Room 25 is already such an amazing album and “Blaxploitation” is one of my favorite songs off the album. The song plays off the film genre in the 70’s also called Blaxploitation and features samples from those films. The music video is set up like an older film, titled “A Film by Noname,” but Noname is not in the video. The video instead features a toddler walking through the city, a giant among the buildings. At the end, viewers see that the city is just a collection of cardboard boxes that the toddler has set up and let their imagination run wild. It’s a great video for Noname’s music video debut and hopefully there will be more music videos coming from her soon.